Today (26th November 2018) at 13:30 hrs. Clin. Prof. Supat Vanichakarn, Secretary General of Prince Mahidol Award Foundation under the Royal Patronage; Ms. Busadee Santipitaks, Director-General of the Department of Information and Spokesperson of the Ministry of Foreign Affairs; Prof. Vicharn Panich, Chairman of Prince Mahidol Award Youth Program Steering Committee; Prof. Apichat Asavamongkolkul, Chairman of Prince Mahidol Award Youth Program Working Committee; and Prof. Sompop Limpongsanurak, Chairman of Prince Mahidol Award Youth Program Selection Committee, together issue a press release on the names of Prince Mahidol Award Youth Program scholarship recipients for 2018 at the Hall in front of Prince Mahidol Aduldej Room, 4th floor of Siriraj Medical Library, Faculty of Medicine Siriraj Hospital, Mahidol University. 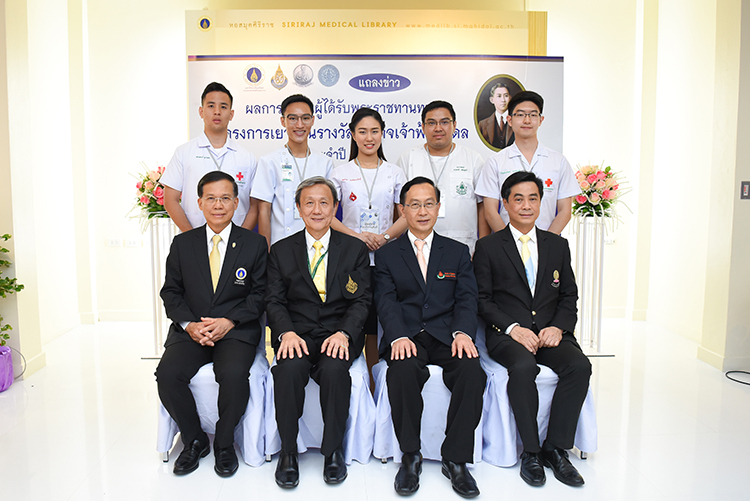 Twenty-one applicants from 9 institutes were nominated for Prince Mahidol Award Youth Program in 2018. Only 5 successful applicants meet the criteria of Prince Mahidol Award Youth Program. The Selection Committee selected the scholarship recipients and presented to the Board of Trustee which HRH Princess Maha Chakri Sirindhorn is a President. The final decision had been made on the 2nd November 2018. Prince Mahidol Award Youth Program has been established on the 20th November 2008 according to the 2nd/2008 consensus of the Prince Mahidol Award Foundation Committee. 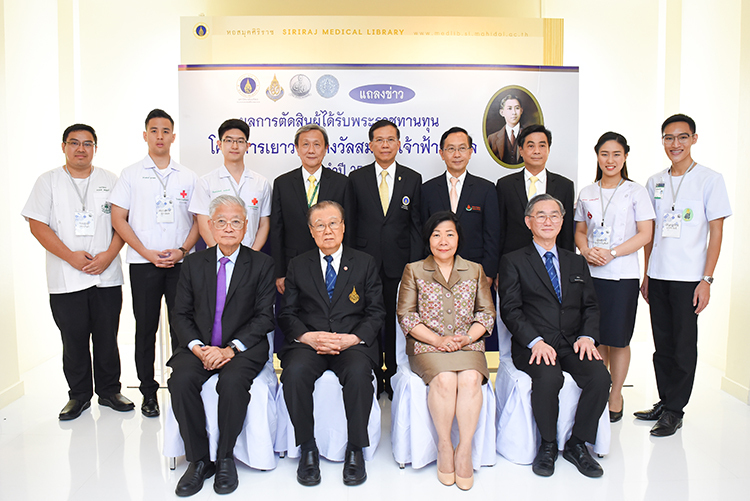 The program aims to inspire and facilitate Thai youths studied in the health fields to pursue their dedicated life for the benefit of mankind following the footsteps of HRH Prince Mahidol of Songkla. 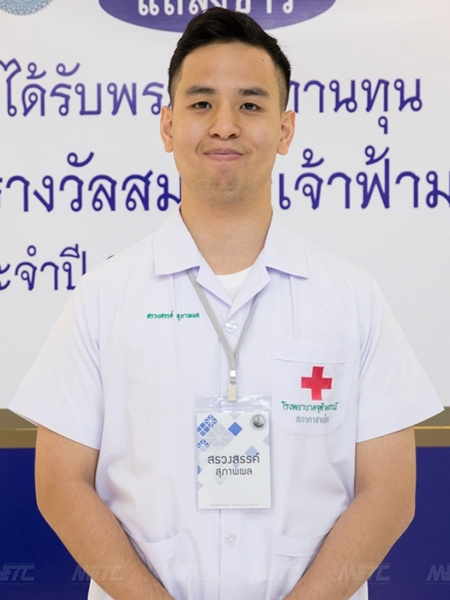 Mr. Kanjapat Temahivong is a sixth-year medical student at the Faculty of Medicine, Chulalongkorn University. He is interested in research topics about the development of an automated glaucoma screening device using a virtual reality headset and machine learning techniques for analyzing the database of glaucoma patients, which are becoming a foundation of automated eye disease screening system in the future. Glaucoma is the leading cause of irreversible blindness; it has increasingly become a serious public health issue in Thailand over the past several years due to the aging population. Because patients with glaucoma are usually presented at the hospital when the disease is at an advanced stage, the diagnosis is likely to be given too late to prevent the patients from blindness. In addition, medical devices for glaucoma screening are still very expensive. Developing more attainable glaucoma screening devices would significantly help reduce the number of blindness patients from glaucoma. He is intending to focus his study on visual science applied to advance glaucoma screening devices, health database system of eye patients and glaucoma screening protocol in the United States of America. 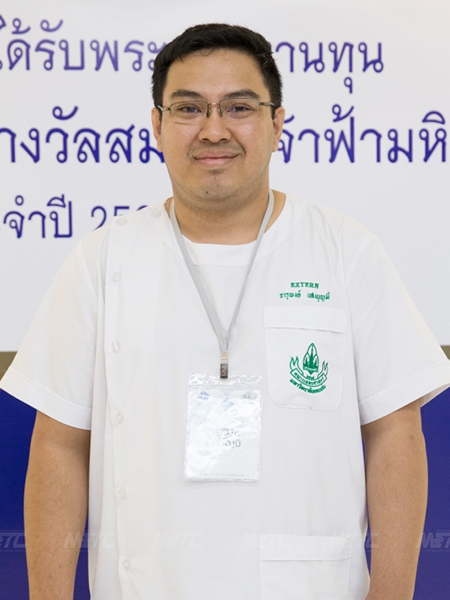 Mr. Charupong Saengboonmee is a sixth year medical student at Faculty of Medicine, Khon Kaen University. He is interested in the field of molecular oncology focusing on the association of diabetes mellitus (DM) and cholangiocarcinoma (CCA). The research topic of his interest is roles of cyclins and cyclin dependent kinases (CDKs) in diabetogenic glucose condition as a potential target for cholangiocarcinoma treatment. His inspiration is from the world highest incidence of CCA in the Northeast of Thailand. Moreover, among these CCA patients, 30-50% of them had impaired glucose metabolism or DM. The in vitro study in CCA cell lines strongly suggested that high glucose level promoted the aggressive phenotypes of CCA cells, namely proliferation and metastatic potential via the up-regulation of several proteins. One of the key proteins in CCA progression under high glucose condition is cyclins and their CDKs partner. The previous studies also suggested that this protein group possesses variable roles and have a high potential to be a target for cancer treatment. Thus, he intend to study the roles of these proteins in CCA under DM condition in order to develop the target of CCA treatment, especially for those CCA patients who also suffer from DM. 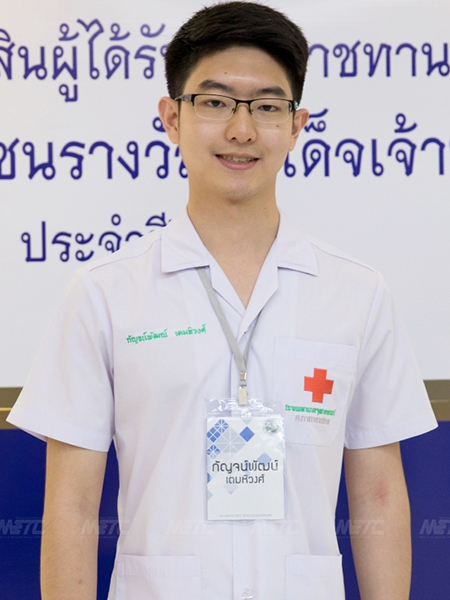 Mr. Punyapat Maprapho is a sixth-year medical student at the Faculty of Medicine Siriraj Hospital, Mahidol University. He is interested in the field of metabolomics, a novel technology to study the chemical process, and metabolomics-nephrolithiasis relationship in the diagnosis and predicted the recurrent of nephrolithiasis in the Thai population. The nephrolithiasis is the common etiology of end-stage renal disease ongoing renal replacement therapy (RRT) in Thailand. With an inconclusive understanding of the pathogenesis of nephrolithiasis, early diagnosis, prediction, and prevention of stone formation are still challenging. This project aims to make an expansion of the knowledge in the field of nephrolithiasis and its complications and may specific on common etiology of Thai people, Furthermore, this expanding knowledge on metabolomics on nephrolithiasis will lead to further studies and improves diagnosis laboratory feature relationship, to establish standard clinical practice guidelines of nephrolithiasis and result in better patient quality of life. Additionally, he determines to study big data analysis and the transitional medicine of metabolomics in nephrolithiasis and other diseases. 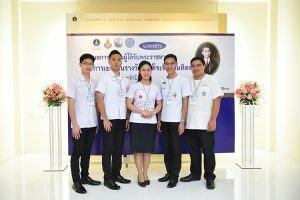 2017 The president of Siriraj Medical Student Union (SMSU); be awarded “Innovative teaching award” in Mahidol quality fair 2017 in the project entitled “Direct experience in early clinical exposure of preclinical students conducted by senior clinical students’ and non-participating students”; poster presentation: “Changes of VARK learning style of preclinical students from the 1st to 2nd preclinical years” and; Oral presentation: “Comparisons of attitudes and behavior toward study between students participating a project entitled “Direct experience in the early clinical exposure of preclinical students conducted by senior clinical students’ and non-participating students” ANZAPHE conference 2017 Adelaide, Australia. 2014 Deputy class president of Medical Student, MD Class of 2014; Head of the religious ceremony, the donated cadavers’ cremation event. 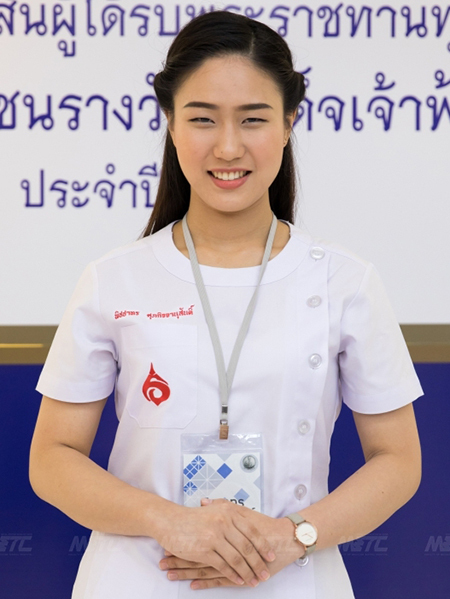 Miss Pichatorn Suppakitjanusant is a sixth-year medical student at the Faculty of Medicine Ramathibodi Hospital, Mahidol University. She is interested in type 2 diabetes mellitus (DM) screening by “voice analysis”. As an increasing in number of DM patients, screening and early diagnosis would be benefit for the early treatment plan and also prevent microvascular and macrovascular sequelae. While the blood test remains the mainstay of DM screening and diagnostic tool, obtaining the blood from venipuncture is considered to be invasive and require skilled health care personnel. Therefore, redefining the non-invasive screening tool to detect DM would be preferential. There were some reports regarding the effect of alteration of blood glucose level would affect changes in elastic properties of phonatory apparatus. Thus, human voice analysis may have a potential to detect the phonatory change in diabetic patients. Her study design is to develop an artificial intelligence via deep learning program to analyze the human voice change as a screening tool for DM. Moreover, she determines to develop a national mobile application for voice analysis as diabetic screening tool. This application would allow early diabetic patients to do screening at home with greater compliance and being cost-effectiveness. 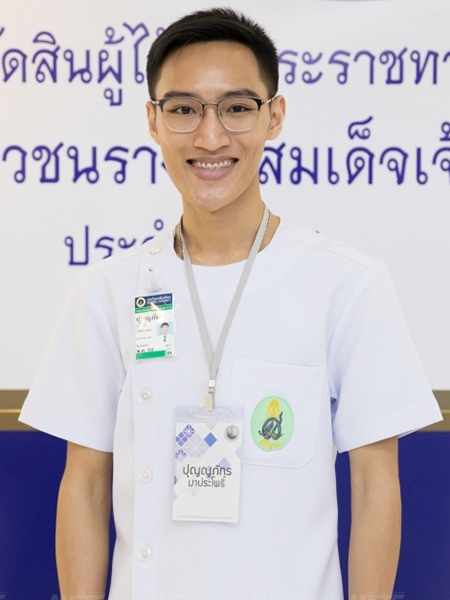 Mr. Suangson Supabphol, a sixth-year medical student from Chulalongkorn University, is interested in the field of cancer immunotherapy, especially personalized tumor vaccine for colorectal cancer. Colorectal cancer is known as one of the most common malignancies in Thailand and worldwide. However, the survival rate of patients with metastasis remains unsatisfactory in spite of the advance of pharmacological research. The reason is that cancerous cells possess genetic variation. Hence, curing cancers has to aim at eradicating tumor heterogeneity. Personalized vaccine starts with potentiating our immune system. As a result, robust immune system will eventually destroy all heterogenous tumor cells automatically. Mr. Suangson intends to study all the workflow of tumor vaccine production including neoantigen prediction, neoantigen identification and vaccine manufacturing.